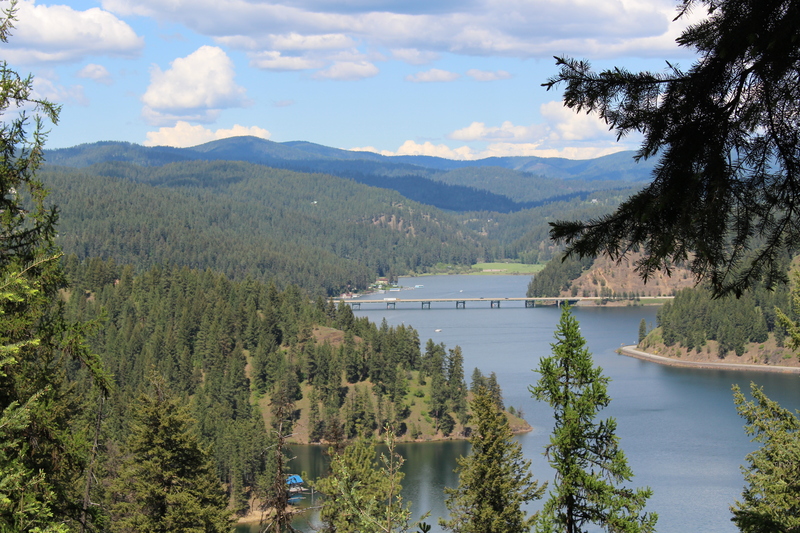 Beauty at every turn: Coeur d’Alene Scenic Byway | Oh, the Places We See . . .
A stop at an Idaho tourist information rest area near Post Falls, Idaho, changed the course of our day. We thought we’d go into Coeur d’Alene, walk around the lake, eat at the resort, and take in the beauty of this city of blue waters. 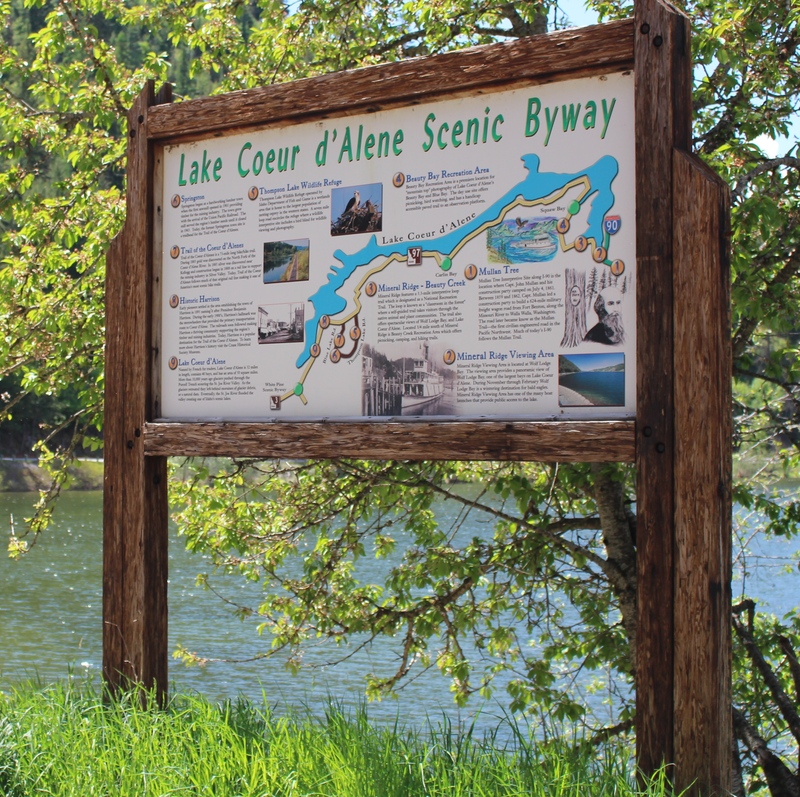 But the lady at the tourist information center brought out a map and showed us Idaho 97, a route called the Coeur d’Alene Scenic Byway. She promised it would not only take us south toward Moscow, our destination, but would afford us spectacular views. How right she was! Located in Idaho’s panhandle, Lake Coeur d’Alene is a glacier-formed lake spanning 25 miles with 135 miles of shoreline. Clear waters, access to beaches, and wildlife such as bald eagles and birds of prey make it a destination for many. The curvy drive begged us to slow down and enjoy the springtime scenery — wide expanses of water, stately homes with beckoning docks, tall evergreens, full-blooming lilacs on bushes reaching roofline heights, and an occasional store like Hutton’s General Store offering travelers and locals a good sandwich and bottle of pop. Photo ops presented themselves at every turn, so we’re sharing with you what we stopped for along the way. It’s a drive to put on your must-see list! Beautiful homes like this one take advantage of lake view. Hutton’s — great stop along the way! This entry was posted in Idaho, Photography, Travel and tagged Coeur d'Alene Scenic Byway, Hutton's General Store, Idaho, Idaho Hwy. 97, lake, Lake Coeur d'Alene, lilacs. Bookmark the permalink. Thanks. Really enjoyed reading this. I’ll revisit your blog. Regards from Thom at the immortal jukebox (plugged in now). You are so welcome. What fun it was for us to discover this route and then take a long, scenic drive on what must be one of America’s prettiest curvy roads! I’d go back in a minute — especially in the fall. Would love to see those leaves turning! I never thought of Idaho as a bucket list destination, but after working there and getting to know the highways, byways, and stunning beauty of the mountains and streams, I can definitely recommend it. What a pretty state! With lovely people within! Thanks for the reply. You are so kind to include me with the others bloggers writing about the West. What a great idea for a blog, and I’m glad you liked this Coeur d’Alene Byway post enough to link to it. Oh, to have more times for long scenic drives across America, right? Thanks again! I love seeing new parts of the country, and this was one of the best. In fact, we are getting to the point of not liking the interstates unless we need an expedient route. Thanks for commenting. We need more time to travel slowly, right? I never thought of Idaho as having a panhandle. But of course! I agree. We think of Florida’s panhandle, but Idaho has a big one — and the forests, streams, fields are lovely there. Thanks for taking a look. How beautiful! I love mountains, blue sky and reflections in water. Me, too. Never get tired of nature’s best. Thanks for reading. So very, very pretty. Loved the photos Rusha. Thanks so much. This lake is one of the largest and prettiest we’ve ever seen! Appreciate your taking a look! Gorgeous. Looks very much like parts of Alaska…the water, the green, the lovely cloud-filled sky. We’ll have to put this one on our travel to list. Thank you, Rusha. Someday we’re going to take that trip we’ve talked about to Alaska! I’ve heard it is stunningly beautiful. Thanks for reminding me to put it on the list. Thanks so much for joining us on the winding road. The scenery was worth every twist and turn. It such a peaceful place. Love these photos, Rusha! It was a quiet morning — a Tuesday, so I guess the weekenders weren’t there yet. Or maybe it’s always peaceful near a lake, and I’m just not used to the quiet. It was a great place! Stopped by there a few years ago on the way to Montana. Great place, great pictures! We really love Idaho. It’s a state with so much to do and so much to see — beauty everywhere! Thanks for commenting! Oh boy! I think there is a house, along there, that put a plexiglass floor in their kitchen, that overlooks a stream…You and your hubby’s adventurous spirit makes my soul fly! I’d love to see that house! And wouldn’t it be fun to watch fish swim under your kitchen floor!!! Thanks for your sweet comments — we change plans frequently, and it’s always worked out pretty well. We love to get off the beaten paths. Thanks so much for commenting. I’m really enjoying all the iris pictures you’re posting, too!